Recently I read a piece by an American living in Europe, recounting how he had found himself in heated argument with a Frenchman who hammered him with America's rap sheet of historical faults and crimes -- it looked like the usual list, if you're familiar with that dreary experience. Among them, of course, was slavery. The American wrote that he largely conceded the point of slavery to his foe, remarking only that it was not really an American institution, just a Southern one. This seemed lame to me, not only because it was, in fact, a national institution, as I have been at pains to tell people for some years now, but because the American could have turned the tables nicely on the Frenchman, if he'd known a little more about French history. French interlopers had jumped into the Atlantic African slave trade in the early 16th century, a century before the first Yankee set sail for Africa. Nearly 200 ships bound for Sierra Leone sailed from three Norman ports between 1540 and 1578. A Portuguese renegade, sailing under the French flag as Jean Alphonse, was one of the pioneers of the "triangle trade" between Africa, the New World and Europe. French slavery totals in the 17th century were lower than they might have been due to incompetence, bankruptcies, and mismanagement and strict royal rules about buying from, or selling to, other empires. By the 1720s, however, French private traders had broken the monopolies and the slave trade boomed under the French flag. During the 1730s alone, the French shipped probably more than 100,000 slaves from Africa. The government raised the bounty per slave delivered to 100 livres, and in 1787 upped it again to 160. By the 1760s the average number of slaver ships leaving French ports was 56 a year, which does not sound like a large number, but they were big ships, averaging 364 slaves per boat. 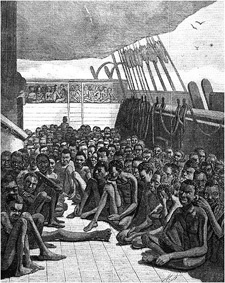 The attendant horrors of the Middle Passage, of course, were multiplied in the bigger ships. In 1767 the French overtook the British in sugar production for the first time. Conditions on sugar plantations were harsh (though French sugar colonies were no better or worse than Spanish, Dutch, or British ones). During the eight-month sugar harvest, slaves sometimes worked continuously almost around the clock. Accidents caused by long hours and primitive machinery were horrible. In the big plantations, the captives lived in barracks; women were few and families nonexistent. Compared to this, North American cotton plantation slavery featured much less ferocious labor and allowed family units to exist. Which is one reason France required a steady flow of thousands of slaves a year -- to replace the ones the French had worked to death -- while America's slave population grew naturally even after the U.S. slave trade had ended. Nantes by far was France's leading slave port. Between 1738 and 1745, Nantes alone carried 55,000 slaves to the New World in 180 ships. All told, from 1713 to 1775 nearly 800 different vessels sailed from Nantes in the slave trade. But Bordeaux, Le Havre, and La Rochelle were leaders in the trade, too. Saint-Malo, Harfleur, and Rouen also played a part. French slave ships bore such ironic names as Amitié (La Rochelle) and Liberté (belonging to Isaac Couturier in Bordeaux). The novelist Chateaubriand's father, of Saint-Malo, was active in the slave trade in the 1760s. In 1768, Louis XV expressed his pleasure at the way "les négociants du Port de Bordeaux se livrent avec beaucoup de zèle au commerce de la traite des nègres." In the late 1660s, the French settled the abandoned western half of the island of Santo Domingo, and by the early 1680s this new colony, which the French called Saint-Domingue, had 2,000 African slaves. By the 1740s, Saint-Domingue had replaced Martinique as the empire's largest sugar producer. Its 117,000 slaves that year represented about half the 250,000 slaved in the French West Indies. Coffee, introduced in 1723, only made the plantations more profitable -- and increased the demand for slaves. To keep the supply of African captives flowing, the French government had permanent establishments at the Senegal River and Whydah on the Gold Coast. French free traders worked seasonal camps from the Senegal to the Congo and even East Africa, where they became serious competitors to the Portuguese in Mozambique. The slaves they bought there went to the French Indian Ocean island colonies, which also were thriving on sugar exports. Slavery went deeper than this in French society. In the 17th century, the French navy galleons were manned by slaves, including hundreds of Turks (some of them captured by the Austrians after the Siege of Vienna). In 1679, the Senegal Company provided 227 African slaves for this purpose. Nor was their slaving activity limited to Africans. As late as 1820s the French were engaged in a slave trade in Sumatra, on the island of Nias (in the news recently as an earthquake site), taking 1,000 slaves a year from there to Ile de Bourbon (modern Réunion). The rise of the French slave trade meant the number of black Africans living in France grew. A law of 1716 clarified their position by allowing masters from the islands to keep their slaves captive while in France. But a law of 1738 decreed black slaves could not stay in France more than three years, otherwise they would be confiscated by the Crown (and likely put to work on the royal navy's galleys). The motive for this was the French authorities' eagerness to preserve their nation's racial purity, as illustrated by a royal declaration of 1777 which forbade entry of any black into France because "they marry Europeans, they infect brothels, and colors are mixed." The restrictions rarely were enforced, however, and six years after the 1777 decree a ministerial circulaire complained that blacks continued to be imported. Merchants in Nantes kept so many black men and women in their fine houses that they could give négrillons or négrittes to members of their household as tips, and by the time of the Revolution there were enough nègres in Nantes to form a battalion (which got a dreadful reputation for murder and pillage). The leading figures of the Enlightenment condemned slavery, but they made little impact on French popular or political opinion. Abbé Raynal in 1770 published a book (in Amsterdam) arguing that slavery was contrary to nature and thus wrong. The clergy of Bordeaux, however, demanded it be prohibited as an outrage to religion and the parlement of Paris ordered it burned by the public executioner. The French Revolution brought such antislavery men to power. English abolitionists like Thomas Clarkson were delighted and encouraged the French liberals to put their words into action. The Declaration of the Rights of Man in August 1789 had stated, "Men are born free and are equal before the law." So you might think, in the interest of consistency, the French would have ended the slave trade and liberated their chattels at that time. You'd be wrong. A Société des Amis des Noirs had formed. One of its leaders was Condorcet, who urged France to follow the example of America, which had set an end date to the slave trade and where leaders from all sections looked forward to the day, expected soon, when American slavery would die a natural death. Condorcet held up America as an example to France in this regard because America's leaders knew they would "debase their own pursuit of liberty if they continued to support slavery." But the négriers of Nantes were powerful and influential. The Constituent Assembly took up the topic of the slave trade in March 1790. So far from curtailing slavery or the slave trade, it simply passed a decree, "Whoever works to excite risings against the colonists will be declared an enemy of the people." The French Assembly even had the equivalent of the American three-fifths clause, which gave the West Indian colonies 10 deputies in Paris, even though they numbered only a few tens of thousands of free settlers. But the Assembly rejected a few free mulattoes who turned up among the West Indian deputies and refused to seat them. Mulattos in Saint-Domingue, learning that their hopes for equality in the new system had been quashed in the Assembly, rose in revolt, and turmoil spread through the colonies. This forced the leaders of the Revolution to reopen the issue and condemn slavery -- in principle. It was not enough. Saint-Domingue's slaves then rose in a bloody insurrection. There were 450,000 blacks, most of them slaves, against only 40,000 whites (mulattoes numbered about 50,000). Finally, in August 1791, the Assembly declared anyone who landed in France to be free, but it was too late to save Saint-Domingue. The British had occupied the colony and re-instated slavery, and by the time they handed it back to France at the Peace of Amiens (1802) the French had gotten over their flirtation with emancipation and were back in the slavery business. Saint-Domingue fell in the only successful slave revolt in history and was reborn as the free nation of Haiti. Meanwhile the shortage of sugar in Paris that resulted from the slave revolt precipitated the riots that brought the Revolution crashing down from its high ideals into authoritarian repression. In 1794 the Convention in Paris declared the universal emancipation of slaves, but it did not actually outlaw the slave trade. Yet even this proved unenforcable; the colonies required slaves, and under Napoleon, slavery was reintroduced. But it also is true that an abolitionist movement had taken root among the fashionable in Paris, headed by Madame de Staël and the Marquis de Lafayette. It was built on admiration of the English abolitionists, a rise of Christian morality, and a cult of le bon nègre. They began to circulate petitions and pamphlets. Prominent French writers led the opposition to the change, with racist diatribes against Africans. When the Duc de Broglie became prime minister, he brought abolitionist sympathies and opinions with him into the government. In 1817 the French government published a decree curtailing the slave trade to French colonies, but the enterprising merchants of Nantes and Bordeaux simply switched their destinations to Cuba. The entire slave trade finally was declared illegal in France in March 1818. But that merely converted a tolerated trade to a clandestine one. With the local banks and political interests dominated by slave traders and their money and marriage ties, there was little hope of enforcement. French officers expelled from the Navy after the Restoration had taken up the slave trade. Their comrades still in the fleet turned a blind eye to their activities, or were easily bribed to do so. The French filled in the market for slaves in Cuba and Brazil in place of the Spanish, who had foresaken the trade as immoral. As late as 1825, slave chains and manacles could be openly purchased in Nantes. On average, French négriers in the 1820s brought in 4,000 slaves per annum. Guadeloupe was the center of this activity, absorbing 38,000 slaves from 1814-1830. Martinique followed with 24,000, and French Guiana with 14,000. "[I]t was an unusual trade in that French merchants from Nantes continued to dominate the trade to the end and were the only Europeans still active in the trade after 1808." [Klein, p.198] As late as 1830, Nantes kept 80 ships engaged in the slave trade. The French, like the Americans, even after they had ended the slave trade refused to stand for the British Navy -- the only maritime power large enough to police the Atlantic -- boarding and searching their vessels. Under cover of national prde, the merchants of Nantes and Bordeaux continued to ship slaves even after the American government had, like the British, begun to use its authority to curb the trade. In 1820, a British cruiser chased a French slaver, La Jeune Estele, whose captain, once he saw himself being overtaken, started throwing barrels overboard. In each was a pair of slave girls, age 12 to 14. Public opinion in Britain was shocked, but in France the people blamed the British. In 1821, an over-zealous U.S. Navy lieutenant named Stockton seized four French-flagged vessels off Africa, convinced that they really were slavers from North America. He manned them with American crews and sailed them to Boston. But the French government was outraged -- at least one of the vessels, La Jeune Eugénie, certainly was French, and it was going for slaves. The French ambassador called on Secretary of State John Quincy Adams and loudly threatened war if satisfaction was not made. President Madison hastily backed down and assured the French that the Americans no longer would search vessels under French or any other foreign flag. Stockton's supicions were reasonable, however. Slave traders of other nations often sailed under the French flag to avoid British searches. Only in 1830, under Louis-Philippe, was the slave trade made a crime and punishment enforced. A treaty with Britain even allowed British naval searches of French vessels in certain cases. Yet as late as 1848, recently imported slaves from West Africa were found on Martinique and Guadeloupe. During the 1840s, the government in Paris talked of the eventuality of emancipation, but it always found a reason not to act. One common excuse was that the government was too cash-strapped to pay the slaveowners the compensation they deserved for the loss of their property. Slavery finally was abolished in Martinique, Guadeloupe, French Guiana, and Réunion by the government that came to power after the 1848 revolution, spurred by slave uprisings in the colonies. A year later legislation passed granting the owners of France's 248,560 slaves compensation from a sum of $120 million francs. Even the end was not really the end. From 1850 to 1870 some 18,400 Africans were carried to the French West Indies illegally, probably by Cuban slavers. *Figures are from Hugh Thomas, "The Slave Trade," Simon & Schuster, 1997. 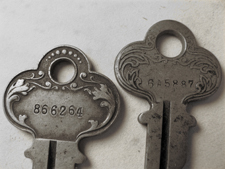 The numbers necessarily are estimates, but historians are in broad agreement about them. There's a "low" and a "high" figure for African slavery, and Thomas' numbers represent the low figure. But the overall comparison does not change much if you use the (earlier) higher numbers: Slaves delivered to French West Indies come in as 1,635,700, compared to 559,800 for British North America and the U.S.
None of us knew at the time what weaponry Saddam had. Probably not even Saddam knew. We all chose  overthrow him or leave him alone  based not on our wisdom or our ignorance but on the gap between them. To dismiss James Buchanan's adherence to the Constitution as a cover to allow treason is to write off the foundation of the American republic. If some crisis erupts and Lincoln does nothing, then his masterly inactivity proves his genius. If some crisis erupts and he makes a sudden change, then the bold stroke proves his genius. Maybe, by keeping the "Nazi" insult alive as the worst one in our cultural vocabulary, the partisan loudmouths are doing us a small favor.